the Play will be shorten'd". Our performance has a serious message -- in the eighteenth century people went to the theatre to be entertained in a general sort of way, and the theatre stars and the `night out' were more important to the paying public than the play. Few people today realize the importance of music and dance to the playhouse in this period -- both as an integral part of the play and more frequently, as entr'acte interludes and afterpieces. The subtitle is taken from a 1703 advertisement for a performance of Rowe's The Fair Penitent:- "With Four Entertainments of Singing (entirely New) by the Famous Segniora Francesca Margarita de l`Epine; to which will be added, the Nightingale Song; It being the last time of her singing whilst she stays in England. The Instrumental Musick Compos'd by Signior Iacomo Greber. With a Country Wedding Dance by Monsieur L'Abbé, Mrs Elford, and others. Also a New Entertainment of Dancing between Mezetin a Clown, and two Chair-men. With the Dance of Blouzabella by Mr. Prince and Mrs Elford. By reason of the Entertainments, the Play will be shortn'd." The presence of French dancers and musicians in our show is not simply gratuitous. At this time, music from French operas and the highly stylised form of French dance were very popular in England both in the ballroom and on the stage. French dancers were brought over from Paris at exorbitant cost to perform entr'acte dances in the London playhouses. Monsieur Balon, star of the Paris Opera, was paid a fee of 400 guineas by Betterton to perform at Lincoln's Inn Fields for some five weeks in 1699. Among the most popular forms of entr'acte entertainment was the pantomime. This began life with the insertion of ‘night scenes’ based on the commedia dell'arte characters imported from the Italian Theatre -- Harlequin, Columbine, Pantaloon and the others. The name itself however derives from the efforts of John Weaver to re-create ‘an entertainment in Dancing and Music in imitation of the Pantomimes of the ancient Greeks and Romans’. The latter were serious affairs, evoking the themes of classical antiquity, with tales of Gods and Demons, Mortals and Magic. In time the two strands, the comic and serious, became interwoven to form a continuous narrative, though usually with separate plots. This was generally performed as an afterpiece to the main work of the evening, often a serious play. The popularity of these extraneous entertainments was such, however, that it provoked considerable hostility from the playwrights, who felt the seriousness of their work being undermined. At the same time, they were forced to acknowledge that the economic survival of serious theatre frequently depended upon the ability of the pantomime afterpiece to bring in the paying public. This ambivalent attitude persisted through much of the 18th century. In time, however, the pantomime evolved as an art form in its own right, to occupy the entire performance. This move may have been encouraged by the success of other new dramatic forms such as the Ballad Opera (the best known of which is Gay's Beggars' Opera) and by the end of the century it had adopted much of the familiar storyline format that we know today. To create the present show, Chalemie has taken elements from some of the most popular pantomimes and other theatrical entertainments of the early 18th century, including the several pantomime versions of Perseus and Andromeda, and woven these into a narrative that will give some feeling for the rich variety that would have existed in the original productions. 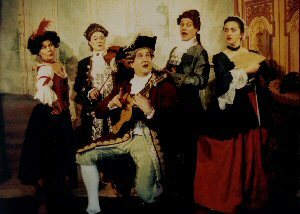 Our ‘play’, The Famous History of the Rise and Fall of Massaniello, was written by Tom D'Urfey, friend and collaborator of Henry Purcell, and first appeared in 1699. While sharing many of the pantomimic aspects of our work, particularly in the comic character of the unfortunate Blowzabella, its intention was serious drama. Although it enjoyed little success in his lifetime or after, there are records of occasional productions up to 1725. Most of the dances in the show have been reconstructed from existing 18th century choreographies, preserved in the notation published by Feuillet. Several of the songs are taken from operas by well-known composers -- such as Handel and Purcell. This practice was quite common in the 18th century when an aria from a completely unrelated work, or a popular song, might be inserted into a pantomime, with or without a change of words to suit the plot. Much of the incidental music, however, along with the overture, would normally be composed specifically. This particularly applied to the ‘Comic Tunes’ used to accompany the activities of Harlequin and his companions, which were often published separately. For the present work we have selected pieces from the Comic Tunes composed by De Lavaux for a pantomime of the mid 18th century, together with those of Michael Arne for The Choice of Harlequin.